On the banks of the River Itchen, adjacent to Northam Bridge and the A3024. Access to the site was from rear. Television Centre, Southampton was home to the three ITV contractors for the South and South East region: Southern, TVS, and Meridian. It was also known as The Southern Television Centre, The Southampton Television Centre, and unofficially as The Northam Studios. The studio centre was constructed in 1967, vacated in 2004 and demolished in 2008. The site lay empty until 2016 when a £40 million development scheme to build 350 flats began. The site was built by the first ITV contractor for the South, Southern Television, as replacement facilities for their converted cinema studios. The new complex was located on the same site as the original cinema, on land reclaimed from the River Itchen. The new complex was state of the art and fully equipped for colour television, launched in the region in 1969. Southern moved into the new complex on 19 August 1969. The site had two large production studios, ready to produce many of Southern's programme productions for the ITV Network. It was from here that Southern's news operations were based also, with a separate studio for their news programme, Day by Day. The site also featured access to the river where Southern's motor boat Southerner, could be moored allowing for easy and quick access for a news team to take to the water. During the 1980 ITV franchise round, the region was sought after, having the highest advertising revenues. Southern was replaced as ITV contractor by Television South, or TVS for short. In August 1981 TVS completed the purchase of the site but, prior to the new company taking control of the region, they had no office space within the buildings and so based operations in Portakabins located in the car park, while Southern continued their operation inside. This was mocked on the closing night of Southern, with the song 'Portakabin TV', performed by Richard Stilgoe, though the arrangement was later repeated by Meridian as they waited to take over from TVS. The new contractor continued producing programmes at the Southampton base, and increased production significantly throughout their period. As a result, they created a number of extensions with a new car park, scenery blocks, production offices and a location facilities garage in the ex-Fairways Marine building. The main office building was connected to the studio block by an elevated walkway. TVS continued successfully until 1991, when another franchise round occurred and they lost, possibly as a result of financial problems the company occurred following the takeover of MTM Enterprises. The new franchise holder, Meridian Broadcasting, originally had plans to base itself in an office unit (which it did a little over 10 years later), as its operation required only presentation and play out facilities with a small studio for local news. 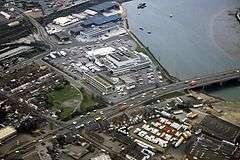 They had no plans to make programmes themselves and would therefore have no use for a studio facility as large as the TVS base in Southampton. This would have left TVS with two studio complexes, the modern studios in Maidstone being their choice for a base as an independent production company. However, following TVS's franchise loss, the two companies negotiated the takeover of the studios by Meridian, ending in Meridian's purchase of the Northam studio complex. This also preserved a number of jobs originally not planned by Meridian. However, it still meant huge job losses: 100 of TVS's original workforce of 760 continued to work for Meridian, the others mainly working as freelances, many for independent companies. On 1 January 1993, Meridian took control of the franchise. Despite not originally intending to own such a huge facility, they did put it to good use, with some productions made in the studios there. Meridian also rented out these studio spaces to other independent production companies, including programmes commissioned directly for Meridian. Following Meridian's merger with Anglia Television and HTV to form United News & Media, some playout and presentation facilities for these regions were moved to Northam, saving the company a significant amount of money. Their productions also increased in 1997 following the launch of Channel 5, which was part owned by United News & Media, as many of the new channel's programmes were made at Northam. However, in 2000, United News & Media's television assets were bought by Granada plc, which in 2004, merged with Carlton Communications to form ITV plc, a new company owning all the ITV franchises in England, Wales and South Scotland. This also left the new company with at least thirteen studio complexes: the production centres of all of the companies they had taken over. It was decided that this number should be reduced to The London Studios, formerly of LWT, The Leeds Studios, formerly of ITV Yorkshire and The Manchester Studios (alternatively called 3sixtymedia), formerly of ITV Granada, with all other studio complexes being sold and replaced with small scale offices and news gathering centres. Meridian's studio complex was not as big as some of the other production sites, was too close to The London Studios to be useful and was not in a central location. It was surplus to requirements for the region, and was nearly 35 years old. It was therefore decided that the studios would be closed, and all operations moved to a new purpose built unit at Whiteley. The last network production at the studios was in June 2004, with the last live programme being the late night Meridian Tonight, on 17 December 2004. As the new studio complex was fully equipped, all equipment, furniture and other more unusual lots: the original TVS portakabins for example, were auctioned off on 3 March 2005. In the years following the move, some areas of the studios were dismantled, with technical equipment being stripped from the building, such as miles of cables. For many years after this, the building stood empty and neglected while a decision was made as to the future of the site. Demolition of the outlying buildings began in the summer of 2008. The site was partially dismantled and demolished and then the main building – the original studio built by Southern – was finally demolished in 2009. 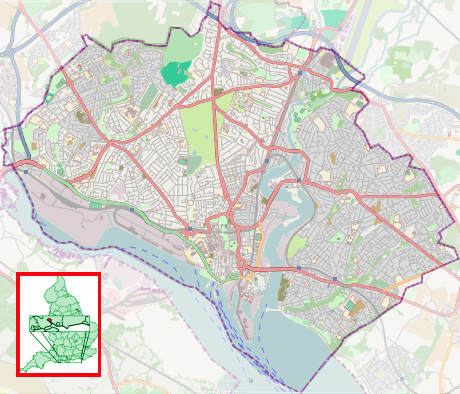 The site remained empty after its initial developer, Oakdene, went into administration in 2009. In 2015 work started on surveying and clearing the site ready for the anticipated construction of 350 flats on the site by Inland Homes. 1 2 "Development at former Meridian site in Southampton finally gets underway". Daily Echo. Retrieved 15 April 2016. YouTube slideshow of derelict complex – Uploaded by YouTube user CentralSouth. Contains photos taken when he visited the derelict site in June 2008, four years after Meridian's departure.